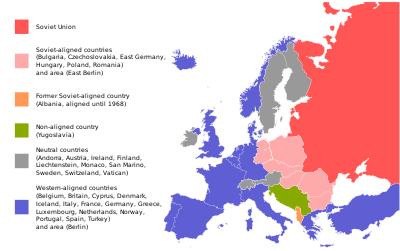 The Eastren Bloc wis the group o communist states o Central an Eastren Europe, generally the Soviet Union an the kintras o the Warsaw Pact. ↑ Compare: Janzen, Jörg; Taraschewski, Thomas (2009). Shahshahānī, Suhaylā, ed. Cities of Pilgrimage. Iuaes-series. 4. Münster: LIT Verlag. p. 190. ISBN 9783825816186. Retrieved 2012-12-21. Until 1990, despite being a formally independent state, Mongolia had de facto been an integral part of the Soviet dominated Eastern Bloc. This page wis last eeditit on 21 Julie 2016, at 18:04.